The sari is one of the most important traditional wear in India. You’ve may have only seen it draped the traditional way. Over the years the sari has changed in many ways, moving away from traditional Indian prints to quirky modern prints, the silhouettes of the sari blouse, and much more. While the sari is one of the most elegant and beautiful thing a woman can wear (said by Sonam Kapoor,) many of us don’t know how to drape it to perfection, including me! 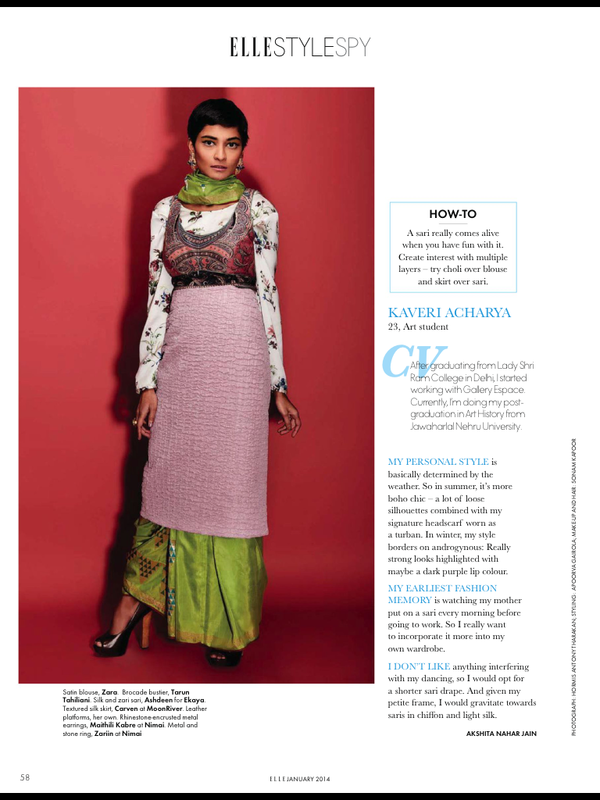 Elle India has done a spread with four fashionable women with draping the sari in an unconventional twist. Aayushi Bangur, one of my favorite fashion blogger from Mumbai, India has been featured in this spread. Looking as gorgeous as ever, the way she has been styled makes her look like a Greek Goddess. I absolutely loved this fun spread, because it gives the sari a whole new look and it gives inspiration to drape it in unique ways. Go grab your copy of Elle India now!